I must confess. I’ve been angry at God. That ugly, incredibly uncomfortable, I can’t even talk to you kind of anger. Have you been there? Many times over the course of my lifetime I’ve found myself in that space. There were years trapped deep in the throes of my addictions. I remember wondering why He abandoned me for so long. Once I entered recovery, I finally realized He was always by my side or there’s no way I would have survived those long, dark days. When my daughter was diagnosed with diabetes a year and a half after her father lost his life to the same disease, I was furious with God. The thought of my baby girl dealing with an illness I watched her dad slowly die from became too much for me to bear. I so needed to turn to Him in those overwhelming moments, but instead I did the opposite. I eventually found my way back to Him only to end up with that same intense anger years later in the back of an ambulance by my son’s side as he battled a grand mal seizure, right before his epilepsy diagnosis. The darkness and inability to understand these afflictions placed on my precious little ones wouldn’t allow me to let God in at a time I needed Him the most. After finally realizing my children’s illnesses would someday become their sermons, I knew He would use these struggles to allow them to serve others in very special and significant ways. By opening my heart to God, my anger eventually turned to understanding and trust again. This doesn’t by any means imply that I don’t get angry at God anymore. I still find myself back there every now and then, but thankfully it looks quite different these days. 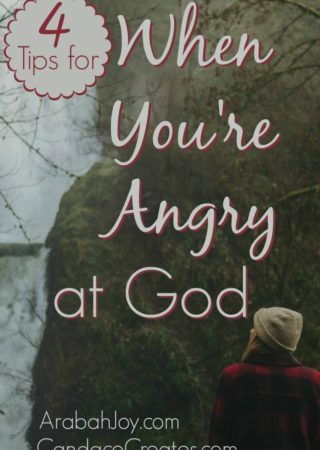 It’s ok to be angry at God. In those earlier seasons of my life, my faith was on shaky ground to start with, even before the fury over addictions, abandonment, and illnesses set in. I thought I wasn’t allowed to be mad at Him, so in times that anger arose there was no need to even try talking to Him. As my faith has grown, I realize He can absolutely take it. I share everything with Him now openly and honestly, even the not so warm and fuzzy feelings. Here’s the cool part: Our relationship is stronger than ever. We can’t hide anything from Him. No matter how hard we try to pretend we are completely good with God, He sees deep inside our hearts. He can’t be fooled by our smiles and false prayers of thanksgiving and joy. Definitely keep true prayers of gratitude coming too, but make sure you are spilling it all before Him, the good, the bad, and the ugly. Don’t let being angry at God lead to sin. During my addiction years, my anger took me so far from God that I didn’t care what kind of life I led anymore. I truly believed it couldn’t possibly matter. Many of my addictions arose from earlier life circumstances. My sad, angry heart started breaking in childhood. I didn’t personally know Jesus back then as I do today. If we can find a way to tell God about our anger as it arises and not give the devil that foothold, I think we could save ourselves a lot of heartache. Our anger will never take away the breathtaking love He has for us. 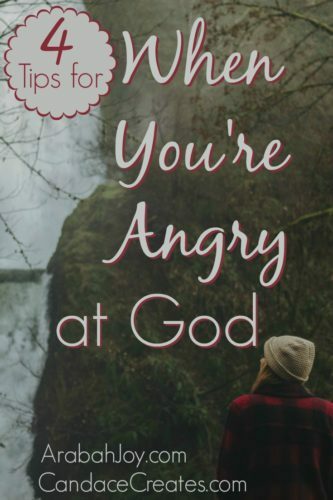 If you find yourself angry at God, go to Him. He loves you in a way that is not humanly possible. Confessing these darker feelings to Him have grown my faith by beautiful leaps and bounds. Candace Playforth is a wife, mom, Jesus follower, serenity seeker, and writer on a quest for health in body, mind, and soul. Join her in creating a healthier body, emotional well-being, and unprecedented faith at CandaceCreates.com. Connect with her on Facebook, Twitter, Instagram, and Pinterest. Missionary Incognito and Online Mentor, I disciple others through a mix of story, transparent example, and practical instruction centered around God's word. I'm married to Jackson and am the bio and adoptive mom to four littles. Our family currently lives on the 26th floor of a hi-rise in Asia. Thank you, Jill. It’s been in recent years that I’ve learned how intertwined our mind, body, and soul really are. It’s so nice to meet you and learn what an important passion we share :)! Wow Candace what a powerful post. I love this. I have had times where I have felt angry with all that was on my plate and wondered why, but as you shared that really isn’t helpful. For indeed he does love big and freely and will help us manage whatever is on our plate no matter what! I’m trying not to ask “why” these days, Jen. It can be really hard though. The more I let go of that little word, the stronger my trust and faith in Him becomes. That certainly makes it a worthwhile strategy ;). Beautifully said, Candace. Thank you for sharing so honestly what so many of us have experienced. Unfortunately, I don’t think any of us can escape those moments of anger in certain seasons of life, Stephanie. We just have to learn to get through them with our faith intact. Thankfully, our relationship with God is usually strengthened during those struggles :). What a wonderful, powerful post Candace. I’ve struggled with being angry with God in the past. It’s a horrible feeling because it just feels wrong… and sinful. Then I feel guilty for being angry with God. It’s like this terrible vicious circle. I appreciate your insights here so much… especially your point that being angry will not change His love for us. Thank you, Jennifer. I have gone around that vicious circle of guilt many times. It’s really quite freeing to lay it out on the line with God. He already knew how we felt anyway :). And yes, His love doesn’t change. That’s a powerful thing to keep in mind! Dear Candace … thanks for putting this on the table. It’s funny how we think that maybe God doesn’t know about how we’re fuming with hurt / frustration / fear. His arms are open, He longs to comfort. What takes us so long. Thank you for this reflection. And for the reminder that our illness / woundedness / sorrows become our sermons. I read about our struggles becoming our sermons in Before Amen by Max Lucado, Linda. I absolutely loved that whole thought and concept. Such truth! Something stood out in the post that I definitely needed to hear today: the fact that He is always with us. It is so easy to forget this fact when we have been driving hard in a storm for what feels like forever and we cannot see a way out. The wind and the fog cloud all visibility and, with it sometimes, hope. Thank you for this gentle reminder today. It is definitely easy to forget in those dark moments that He is right there beside us, Rosa. I completely agree. Losing hope is the scariest part. We serve an awesome God though and He will provide :). I am hanging on to the idea that our current struggles are our future sermons. That is a grace-filled view of life! Visiting from #RaRaLinkup. I hold tight to that thought as well, Kelly. It’s from Max Lucado. Thinking of our hardships in such a positive light is truly life-changing. Thankfully, God’s love is always constant no matter what we are going through or feeling. Amen, Sonya. I would have been in big trouble over the years if this wasn’t true ;). I have been in those really ugly places with Him as well, Chris. It’s absolutely breathtaking how He loves us through it all. I’m with you in amazement, my friend :).